If you are serious webmaster, Keyword Research should be your #1 Priority. It's important to find potential customers online else you are going to loose your valuable and targeted customers. Therefore: I will find the BEST KEYWORDS for your niche or business! Detailed report containing a list of relevant KW as well as their monthly searches. Each KW will also show its competition, its difficulty to rank for, as well as the Cost Per Click earned from AdSense for websites that use this keyword. 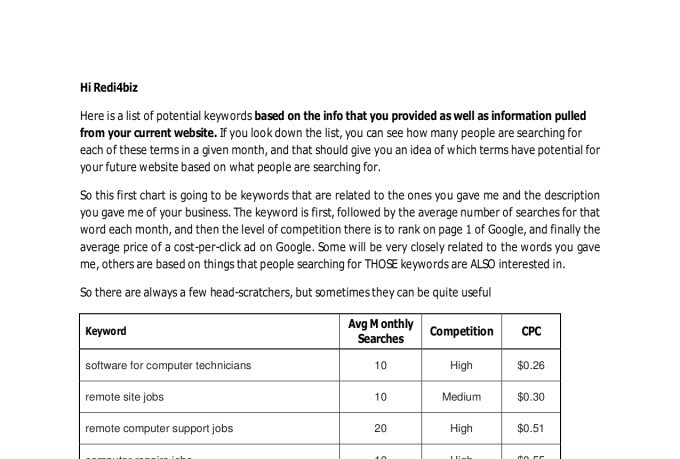 This report will help you decide which words to try to rank on Google for based on their monthly searches and difficulty of ranking for. This report will potentially help you find untapped keywords that are easy to rank for but receive a lot of searches and are relevant to your niche or business.If you are really serious on making your website visible online, this is the best gig for you. The more you know about your niche, the better the chances that you will SUCCEED!